In Elder Scrolls Online, Alchemy is a crafting profession which produces various different potions, much like in the previous Elder Scrolls games. Anyone who has played Elder Scrolls games before knows that alchemy is an useful profession because the crafted potions are often very powerful and can mean the difference between life and death in certain situations. There is a 30-second cooldown for using potions in ESO though, so you are not able to drink them somewhat indefinitely like you were able to in Skyrim. For all skills and abilities, Alchemy included, players need to use skill points to unlock more powerful ways to craft items. The more skill points you use, the better products you’ll be able to craft. Just like in previous TES games, alchemy ingredients also known as reagents can be found and picked up out in the world. 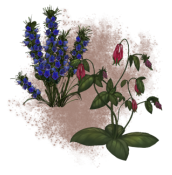 The plants, flowers, herbs and mushrooms, also known as Reagents found in Tamriel all have their specific effects or Traits. A big part of alchemy is finding out the exact effects each different Reagent has. Using that knowledge and combining Reagents is vital in crafting useful potions. To craft potions you need to be at an Alchemy station. There’s two types of ingredients you need: the Solvent, such as water, and the Reagents. Every time you craft a potion you gain experience in Alchemy. Crafting potions with a higher level Solvent increased the potion’s level requirement and strength, plus yields a much bigger experience gain, but it does require you to put skill points into Solvent Proficiency (see below). Any serious alchemist will put points into it, anyway. 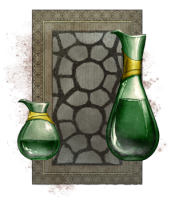 The greater your skill in Alchemy and the more skill points you have invested in that skill line, the more useful potions you can create. The type of potion you create depends on the combination of reagents you use and their Alchemy Traits. You can also create potions with our Alchemy Simulator. Our alchemy simulator also includes a tool that allows you to show all alchemy ingredients with a specific alchemy trait, ie. Restore Health. If you attempt to create a potion using reagents without common Alchemy Traits, the attempt will fail, you will lose the reagents, and you will not receive a potion of any kind. You do still receive a small amount of Alchemy experience, though. This means, in order to successfully create a potion, you need to use Reagents with common alchemy traits. The final effects of the potion will be defined by the shared traits between the Reagents. For example, if you combine Columbine (Restore Health, Restore Stamina, Restore Magicka, Unstoppable) and Bugloss (Increase Spell Resist, Lower Spell Power, Restore Health, Restore Magicka) you will be able to create a potion with two effects, because these two reagents have two common traits: Restore Health and Restore Magicka – the final potion will restore both Health and Magicka. Traits can be countered by their Anti Traits. Ravage Stamina counters Restore Stamina and vice versa. If you combine three reagents with 3 instances of Restore Stamina and 2 instances of Ravage Stamina, Restore Stamina will NOT be in the final potion, because 2 instances of Restore Stamina have been nullified by Ravage Stamina. You need 2 instances of a Trait for it to make it to the potion. When you successfully create a potion, all of the common alchemy traits between the reagents used in the potion creating process will be learned. From then on, every time you deal with these reagents, those alchemy traits will be revealed. To save space & make this guide more readable, I won’t copy paste the full list of potions here. Link to the most useful alchemy potions & alchemy reagents. Each herb, mushroom, flower or plant in ESO comes with four effects which are used to determine the properties of the crafted potion. As you progress in Alchemy, you’ll be able to learn the effects and use this knowledge to craft better-quality potions. For those of you who want to know which plants to look out for, we have compiled a list of all known alchemy reagents and their effects here. This data was gathered in Beta and may not be accurate at launch. The TES fans will be pleased to see Nirnroot on the list! Yup, it does exist in Elder Scrolls Online as well, and it still makes those distinct noises. Looking at the reagent effects, we can clearly see that the usual restore Stamina, Health and Magicka potions will be relevant in ESO. On top of that we’ll have potions that can provide a significant boost in different situations, such as crit boost potions, invisiblity potions, run speed potions and so on. The fun part in Alchemy will be combining different reagents and seeing what kind of potions you’ll end up with. I’ll leave this for you to figure out. Snakeblood reduces the negative effects in potions. It’s hard to say how useful this passive will be. If standard potions have severe drawbacks to them, Snakeblood might be a very valuable skill for all alchemists. Produces 1 extra potion per crafting attempt. Reduces negative effects in potions by 50%.